I’ve made this recipe a half-dozen times with different types of greens and dried beans. My favorite version was a once-a-year deal: I harvested a Treviso-type radicchio from the garden and didn’t want to waste the tougher, outer leaves of the plant. Blanching the greens is optional but will remove some of their bitterness. The original recipe calls for dried lima beans, and a 6-oz can of tomato paste dissolved in 1 cup of water. Almost any type of dried bean will do; I prefer to use up the odds and ends in my cupboard. I also use a jar of tomatoes that I canned last summer instead of the tomato paste and water. The dish can be prepared through Step 3 and refrigerated, up to four days ahead. To serve, proceed with Step 4 (bread crumb topping) but reheat in a 350-degree oven for 15 minutes or until the beans are bubbling and the bread crumbs are lightly browned. 1. Blanch the kale for 2 minutes in a large pot of boiling, salted water. 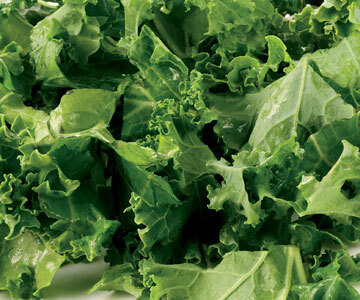 Drain, squeeze out water and chop the kale into ribbons. 2. Heat 2 tablespoons of the olive oil over medium heat in a large ovenproof casserole. Add the onion, carrots and celery. Saute for about five minutes or until the onion is tender. Add the garlic, stir and cook 30 seconds until you smell the garlic. Add the tomatoes and bring to a simmer. 3. Drain the beans and add them to the pot. Add the remaining water, the herbs, and salt and pepper. Add the kale, stir well, and bring to a simmer. Cover the pot and bake in the oven at 225 F for about three hours until the beans are tender and creamy (note: small white beans, such as Great Northern, will cook a little faster – check them after 2-1/2 hours). Taste and add salt and pepper, as needed, and a little more water if the beans are dry. 4. Combine 1 tablespoon olive oil and the bread crumbs. Sprinkle over the beans and bake another 30 minutes to an hour. When the bread crumbs are lightly browned, remove from the oven. Serve right away or let cool slightly, then serve. This entry was posted in Recipes and tagged beans, casserole, kale by jeanne. Bookmark the permalink.